Quality Vintage Fashion Ready For You To Rock! ...very pretty and unique! Thank u very much! The kimono was beautiful! It was shipped quickly. Shop provided great service. Will not hesitate to buy from this shop again! Velvet is so point this season! 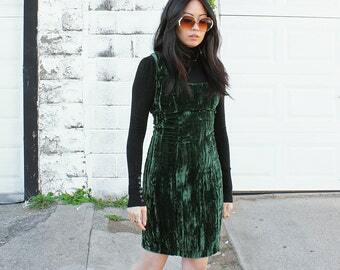 Grab this vintage Betsey Johnson green velvet dress for your Fall wardrobe. It's in the shop now! Everything in the shop is 50% off up to Sept 19th! Grab those vintage statement pieces while they're on sale! CutandChicVintage is the destination for the modern gal with plenty of style swagger. We like to mix n' match our vintage pieces with contemporary pieces already in our wardrobe, so our shop focuses on providing quality vintage fashion with an eye on statement making style and current trends. Each of our vintage finds is hand-picked and every item you receive from us is cleaned, restored, and ready for you to rock upon delivery. We want you to love our vintage clothing just as much as we loved finding them. If you have any questions, feel free to contact us at hello [!at] cutandchic.com or via Etsy convo. Providing excellent customer service is very important to us. We check our emails daily and typically respond within 24 hours. We also guarantee to ship orders fast, sending items within 1 working day upon receipt of payment. It makes me so happy to hear from customers who love what they've bought. I've always loved collecting beautiful and one of a kind vintage items from all over the world, but knowing that they're out there making someone feel special is the best. Welcome to CutandChicVintage on Etsy, the destination for quality vintage fashion that's ready for you to rock! Our entire hand-picked collection has been cleaned, restored, and will be ready for you to wear upon delivery. We want you to love our vintage pieces just as much as we do. Just contact us within 3 days of delivery. Returns should be postmarked within 3 working days of delivery. Refunds will be given in the amount paid for the item minus the cost of shipping and handling, after the item has been received and determined to be in the same condition it was sent. Buyers are responsible for return shipping costs. If the item is not returned in its original condition, the buyer is responsible for any loss in value. We are not responsible for returned items being lost or damaged in transit. We accept payment via Etsy Direct Checkout and Paypal. All major debit and credit cards are accepted. Typically 1 working day upon receipt of payment, unless otherwise stated. Please note shipping times are only estimates and not guaranteed. Shipping discounts are available for orders of two or more items. Pay only $3 for each additional item shipped. The item with the largest shipping cost will be counted as the initial shipping fee. Undelivered items will receive a full refund for their order unless the address entered by the customer in the order is incorrect or missing information. Partial refunds will be given In cases where the address given is invalid or insufficient for delivery or where an item is determined to be unclaimed by the customer. In these cases, you will be refunded for the amount you paid for the item but not the shipping fee. We are not responsible for items damaged in transit but we promise to work with you closely to find a fair solution for both parties. 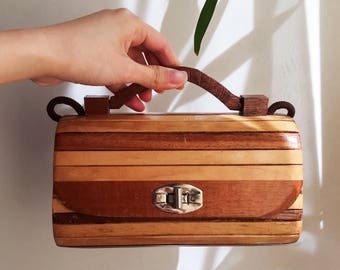 Please keep in mind almost all vintage clothing and accessories have been preloved and will show some signs of wear unless it is deadstock or "virgin vintage" (meaning never worn). Our vintage collection at CutandChicVintage has been hand-picked individually for it's overall high quality. Most of our items are in excellent to very good condition. Usually any flaws or wear are barely noticeable and only perceptible upon very close inspection. Still, any signs of wear or flaws, even if only minor will be mentioned in our descriptions. Please be sure to read the description thoroughly and to view all the provided photos. If you have any questions please feel free to contact us. All items are laid flat and measured across, not stretched (unless otherwise stated), then doubled where appropriate. Measurements are given in both inches and centimeters. Most descriptions include an approximate size comparable to contemporary sizing however please take notice of our measurements for a more accurate fit. Will this item fit me? Every listing has the item's measurements (see Sizing Details for how we measure our items). To visualize how one of our vintage garments will fit you, we suggest taking a similar item from your closet and measuring it flat at the bust, waist, hips, etc. Then compare the measurements you took to our listing's measurements. If you're still unsure, feel free to contact us via Etsy or at hello@cutandchic.com. Yes, we do! Please read our shop policies for our conditions of return. Orders are delivered typically within 1-3 days within the U.S. and 1-3 weeks everywhere else. Please read our shop policies for more information. Do you have shipping discounts for multiple orders? Yes! You can get 20% off your first order by signing up to our newsletter at http://eepurl.com/ytas1. Afterwards, by being a member of our newsletter, you'll have exclusive access to our latest sales and promotions. Is my contact information secure when I make an order? Absolutely! We will only use your shipping and billing address, and contact information to communicate with you about your order and to fulfill your order. We will never use or give away your information to a third-party. We never see your credit card / payment information which is kept secure with Etsy Direct Checkout or Paypal.